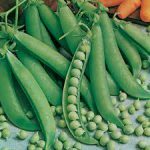 Home VEGETABLE SEEDS Bean & Pea POLE FRENCH BEAN BLACK SEEDS (BEAN CORA BLACK SEEDS POLE TYPE). POLE FRENCH BEAN BLACK SEEDS (BEAN CORA BLACK SEEDS POLE TYPE). Pole French bean (climbing). 55 days maturity after sowing, round-oval pod section, 16-18 cm (6.7 in.) long. Medium green pods. Black seeded variety. Veryhigh yields. Resistance to BCMV(Bean Common Mosaic virus), Anthracnose and Pseudomonas Phaseolicola. SKU: BEAN01. Category: Bean & Pea. BEAN CORA (WHITE SEEDS, BUSH TYPE).